Is this related to a chronic shortage of space in small-sized domestic kitchens or to the fact that most of our compatriots continue to believe that it is easier and faster to wash the dishes with our hands, but dishwashers in Russia are still the most "exotic" household technique. And at the same time, a dishwasher saves about 7000-8000 liters of water per year (compared to manual washing), this is the health and beauty of the skin of your hands, this is the perfect cleanliness of the dishes, which you never achieve with manual washing, this is release of a huge amount time that you can spend on something more necessary and interesting, and, finally, it is an improvement in the psychological climate in the family due to the lack of controversy about whom to wash the dishes today. These simple truths are slowly, but still becoming clear to our citizens, and the attitude of the latter to this type of technology is gradually changing for the better. More and more consumers are wondering how to choose the right dishwasher so that it will become a reliable assistant in the kitchen for many years, so that you no longer have to remember such unpleasant and rather tedious work like washing dishes. Here you are in our review. We hope that for good reason. The main criteria for choosing a dishwasher are its size and capacity, which means you need to take into account two factors - the size of the kitchen and the amount of dishes, which is supposed to be washed daily. The capacity of dishwashers on the market today varies from 4 to 14-15 sets of dishes (a set of dishes usually means a set of three plates of different sizes, a glass (glass), cups with saucer, fork, knife and three spoons). 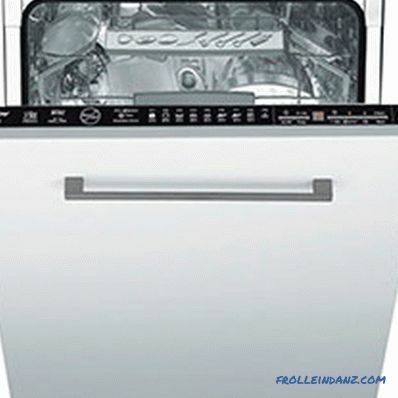 Standard (full-size) models of dishwashers are designed primarily for large families. Having a size of 60x60x85 cm (width x depth x height), they allow you to simultaneously wash 12-14 sets of dishes. (Is this too much in your opinion? But do not forget that you have to load not only plates, glasses and spoons, but also pots, pans and other kitchen utensils used in the process of cooking into the dishwasher.) Besides the larger capacity, full-size machines have Another advantage is that they, as a rule, have a more complete set of functions and many additional options. Owners of small kitchens, where the struggle is for every centimeter of free space, to find a place for a full-sized dishwasher. 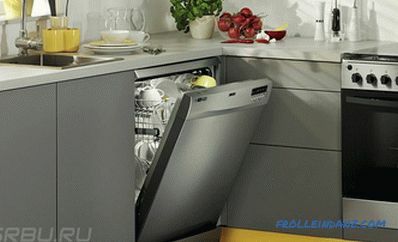 Household appliance manufacturers offer their own solution to this problem - narrow dishwasher models. At standard height and depth (85 cm and 60 cm, respectively), they have a smaller width - about 45 cm. The capacity of narrow cars in comparison with full-size ones, of course, is also less - 8-10 sets. This meets the needs of two or three people, so these machines are ideal, for example, for retirees or newlyweds, in extreme cases - for families with one child. It is precisely the narrow models of dishwashers that are most popular in Russia, because it’s still easier to find a place in the small-sized kitchen, which, alas, is still the main problem of most apartments in our country. Compact models of dishwashers are miniature champions. They have more than modest size - about 45x55x45 cm, so that they can be placed even on the working kitchen table. The capacity of compact models, of course, is also very modest - only 4-6 sets of dishes. Such dishwashers fit bachelors and newlyweds, provided that they often dine outside the house and even more so do not arrange too frequent feasts for a large number of guests. Functionally, they all do not differ from each other. To give preference to one or another variety, you should simply analyze which model is easier to integrate into an existing or as yet designed kitchen interior. Fully recessed dishwashers fit easily into almost any kitchen interior: the appliances are hidden behind a decorative furniture panel, which means that only owners will know about its existence.The control panel for such models is located at the upper end of the door. 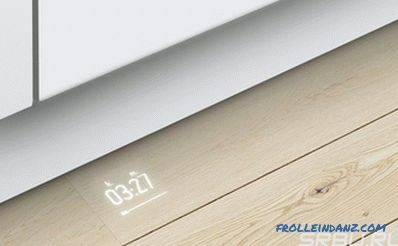 Since the display is hidden from the user's eyes, some manufacturers (Bosch, AEG, Siemens) offer an interesting solution - projecting the image of the display onto the floor covering. However, such a function can hardly be called very necessary, rather it is a fun and expensive toy. 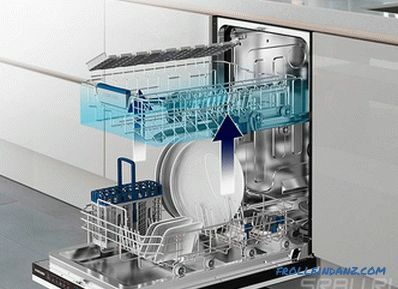 Partially recessed models of dishwashers differ from fully recessed ones only in that their control panel is placed on the front panel (door front). The main advantage of a free-standing dishwasher is that it can be placed in any corner of the kitchen - where it suits you. However, in this case you will have to think about the fact that the new appliances fit well into the interior of the kitchen. The colors of the dishwasher cases are not very diverse - white, silver, black ... (however, these colors are so versatile that you probably can find a solution suitable for your kitchen). 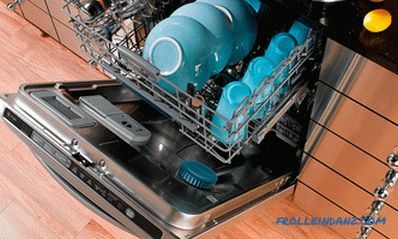 Desktop dishwashers are usually purchased only in extreme cases when the full-size appliances cannot be placed in a small kitchen. Their only advantage - compactness (45x55x45 cm) - is not able to compensate for a bunch of existing shortcomings. First, such machines are designed for only 4 sets of dishes. Secondly, the quality of washing in them often wants the best. And thirdly, and this, perhaps most importantly, they will not be able to wash large baking trays and pans. And if you still have to scrub the dirtiest dishes by hand, the reasonable question arises: why then a dishwasher? Most dishwashers have two sliding baskets (pallets) for dishes, occasionally a third one is added to them. The exception is the compact models, the owners of which have to be content with one basket. 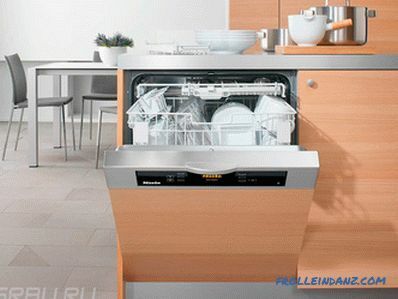 The design and specialization of these pallets for different models of dishwashers are generally similar, although almost every manufacturer has its own nuances. The lower basket is designed for plates and large kitchen utensils (pots, pans, trays, etc. ); top - for cups, glasses, glasses. In the third, uppermost, pan, which is not available in all models of dishwashers, knives, ladles, cutlery are loaded. Each basket is equipped with all kinds of holders and bars, the purpose of which is the convenience of placing dishes and ensuring the quality of her washing. Properly placed and evenly distributed dishes allow water to penetrate into every crack and, therefore, quickly wash off all contamination. A useful option will be folding or removable holders, as well as the ability to adjust the height of the basket. This allows you to load the largest items in the dishwasher. 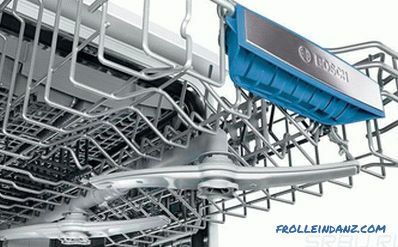 The quality of dishwashing quality is the class A assigned to the specific model of the dishwasher - Class A models show the best result: the dishes are removed perfectly clean and dry. On the dishes, which are issued at the finish of the model with a lower class (B or C), there may be slight residues of contamination and / or moisture. You can find out which wash class is assigned to your chosen model from the documentation attached to it. 1 . 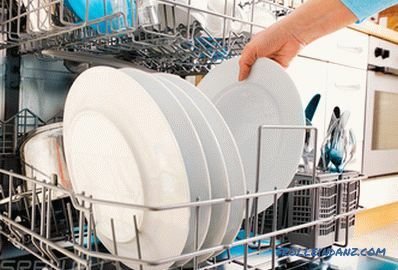 In order for the dishes to shine clean, but your dishwasher does not consume too much water and electricity, you should correctly choose the mode that is most suitable for solving the problem that your appliances currently face. Most dishwashers have 4 modes of washing (there may be more, but these will actually be used most often): fast mode - for lightly soiled dishes, economical (55 ° C) - for moderately dirty dishes, intensive (65 -75 ° C) - for very dirty dishes. If the dishes are so dirty that you doubt its effective cleaning even in intensive mode, it is recommended to turn on the pre-soak mode. 2. 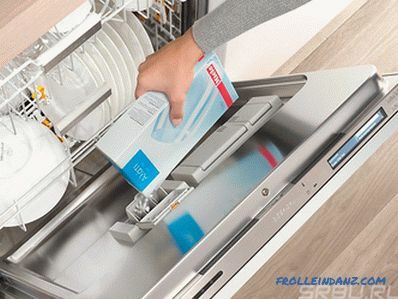 To facilitate the operation of the dishwasher and eliminate the clogging of filters, large amounts of food should be removed from the plates, for example, under the tap before placing dishes in the machine. 3. The quality of the wash (as well as the longevity of the dishwasher service!) Depends on the hardness of the water due to the presence of calcium and magnesium salts. To soften the tap water in many models of dishwashers, it is passed through a special filter filled with ion exchange resin. If an ion exchanger is not provided in your car, a special regenerating salt will help to soften the water, which must be regularly poured into the compartment designated for this. The amount of regenerating salt that must be added before starting the cycle depends on the degree of water hardness. Some companies that produce household appliances, complete with a dishwasher, offer indicator strips that allow you to control this parameter. But the best option is to have an automatic indicator of water hardness in the dishwasher itself. 4. 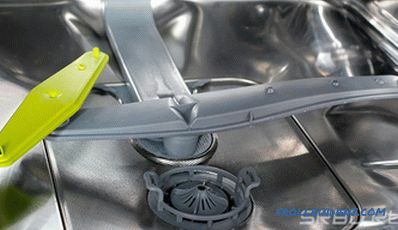 To minimize the residual amount of detergent on dishes, to preserve its brilliance and to avoid the appearance of turbid stains, it is required to regularly pour liquid rinse aid into the special container placed on the car door, which will automatically be added to the water at the rinsing stage. If you try to save on rinse, your glassware will quickly fade. However, it is unlikely you will do it: the savings in this case will be illusory, because the rinse aid consumption is only 3 ml per cycle (i.e. about 1 l per year). Drying efficiency is sometimes evaluated separately, on the basis of which a class from A to G is assigned to a machine. Turbosushka. 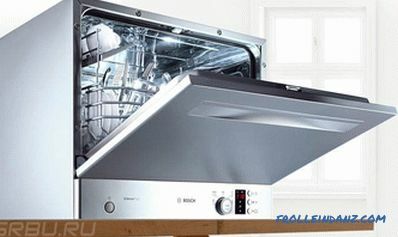 The highest drying class - A - is ensured if the dishes are dried with hot air forcibly supplied with a fan. This so-called turbo dryer is the most energy-consuming, but provides the best result. Condensation Drying. With condensation drying used in many low-priced dishwashers, the evaporated moisture from the plates and glasses condenses on the cooler walls of the machine and simply flows down into a special compartment. This process is long, but more energy efficient, since drying is carried out without electricity consumption. Drying with a heat exchanger is a type of condensation drying. In this case, moisture condensation is not carried out on the walls of the machine, but on the cold circuit of the heat exchanger. In terms of speed, quality and power consumption, this type occupies an intermediate position between condensation and turbo-dryer. Drying is faster than conventional condensation, and in this case there are no traces of dried drops. An excessive amount of electricity, as in the case of a turbo dryer, is not consumed, since air is circulated without using a fan. Here are just dishwashers with a heat exchanger more expensive. 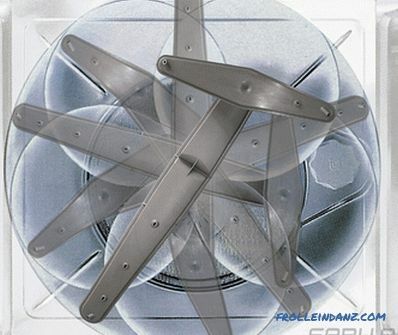 Touch drying is a turbo dryer, but carried out under strict control of sensors. Thanks to the sensors, the amount of energy consumed is reduced to the really necessary level, and the process time is significantly reduced. Of course, SensorDry machines are not cheap. Zeolite drying. The most economical and efficient way to dry dishes today is zeolite drying, the principle of which is based on the ability of the natural zeolite mineral to absorb moisture. 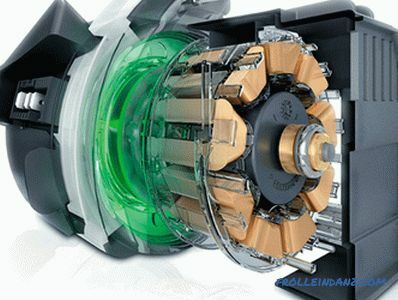 Implemented this technology in the NEFF, Siemens and Bosch models. Already at the stage of choosing a dishwasher, it's time to think about its subsequent connection. 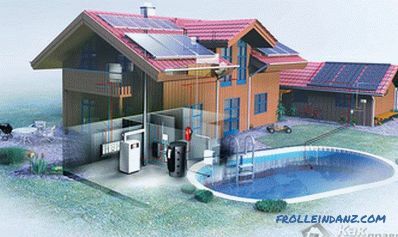 The future user should be aware that some models can be connected to the cold water supply only, others to hot and cold water at the same time. According to experts, the first option is preferable, since cold tap water contains less impurities, rust, etc., than hot water. Of course, grease from dirty plates and pans with cold water will not be washed, but the dishwasher is able to heat cold water to the desired temperature. However, this also implies the main drawback of this type of connection: a dishwasher in its operation will consume much more electricity. "Hot-cold" type of connection is more energy efficient: you can save a lot on water heating. It only remains for a moment to think about what is in hot water besides the water itself. If the quality of hot tap water in your city / village does not scare you, then we recommend to purchase a dishwasher that corresponds to this type of connection. The first thing that all buyers, who choose a dishwasher, pay attention to are its dimensions and capacity. The next object of their attention is a set of programs that this technique is able to perform. All models of dishwashers have several modes of washing, first of all, we are talking about standard, quick and intensive washing.Each model has its own dishwasher capabilities, so when choosing, be guided by your preferences. Ask, for example, how long the fast wash cycle is, or how much energy is consumed by the machine when operating in eco mode. But the washing modes listed above are the minimum set of functions that even the simplest machines have. More "advanced" (and therefore more expensive) models may have a number of additional functions. The functions and settings available in the machine are selected using the control system, which can be electromechanical (with conventional buttons and rotary switches) or electronic (with touch buttons) and convenient display). Dishwashers with an electromechanical control system are more suitable for older people. The last traditional buttons and conventional indicator lights are more familiar, which means it will be easier to master the new technique. Another undoubted advantage of machines with an electromechanical type of control is a relatively low price. Electronically controlled dishwashers, as a rule, have a display, and more and more often not just information, but touch or touch buttons. The menu on the display will help you choose the most suitable program and temperature mode. The display also displays information about the time remaining until the end of the wash, the presence of detergents and rinse aid in the tanks, the hardness of the water used, and information about faults, if any. 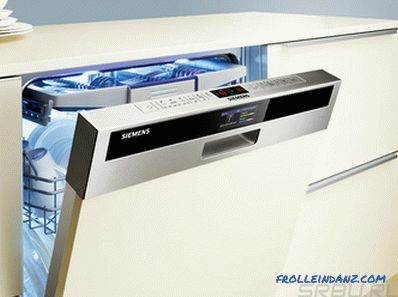 Electronic "brains" are equipped with dishwashers with a large number of functions, so the high price of such models is a result of not only the presence of beautiful and informative screens. When choosing a dishwasher, we recommend first of all to focus on the presence of those programs that you really will use daily. In this case, it is primarily about the basic modes of washing, which we have already mentioned above: economy mode, modes of fast or intensive washing. In addition to the standard ones, there are a number of special programs designed for washing one or another type of dish. 1. 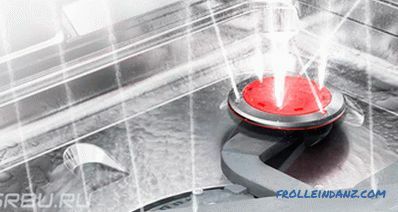 The “Delay Start” function allows you to delay the power-on time of the machine. The dishwasher will start working automatically at the indicated time that is most convenient for you (for example, at night). A similar function is found in almost all modern dishwashers. You can choose a delayed start car for 3, 6 or 9 hours, or a model with a 24-hour timer. 2. 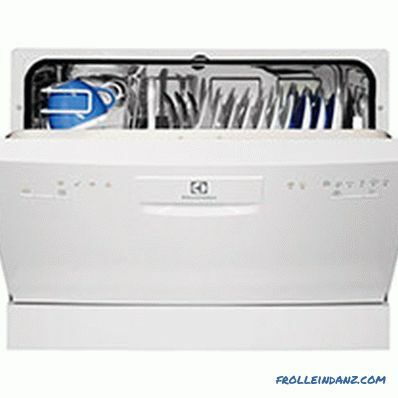 Mode "Half load" is useful when dirty dishes have accumulated too little, at least not enough for a full load. This feature is especially useful in large, roomy models. Washing in this mode is faster, reduces water and electricity consumption, reduces the load on the machine components and, therefore, their wear. 3. The program "Automatic washing" may seem very useful. 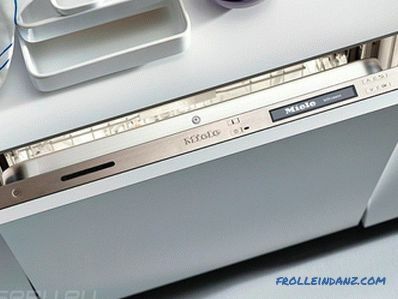 When activated, the dishwasher itself will assess the degree of contamination of dishes and, on this basis, will calculate the time, temperature (from 40 to 75 degrees) and the intensity of washing. 4. 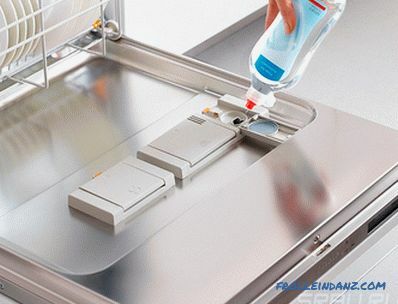 The "Delicate Wash" mode is designed for gentle washing of crystal or fragile glass products. Water in this mode does not heat up above 30-45 degrees. 5. Babycare is a special program that provides very high-quality washing and disinfection of milk bottles and other children's dishes, as well as all sorts of children's accessories and toys. 6. The Sterilization function allows you to kill all the germs that can remain on the dishes even after washing in hot water without using aggressive chemicals. In different models, sterilization can be implemented in various ways, for example, by steaming or using ultraviolet light. 7. Bio-programs will be relevant to you if you plan to use special detergents that contain enzymes that effectively break down fats. Special programs in this case are required, since most of the enzymes operate at a moderate (40-50 degrees) temperature, but they die in hot water. Engineers not only initially create, but then periodically improve many nodes of any complex equipment, including dishwashers. Due to this, new models are becoming more convenient, more efficient, more economical, quieter than their predecessors. 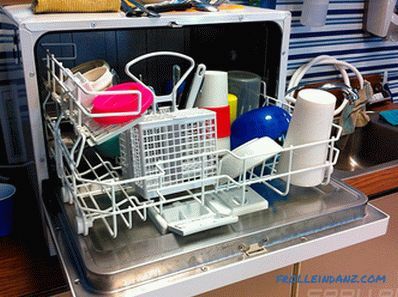 That is why when choosing a dishwasher is not superfluous to pay attention to the individual elements of its design. Having a dishwasher in your house and at the same time manually scrubbing pans, pans, saucepans and pots, i.e. the dirtiest dishes - somewhat stupid, agree. But such large-sized items, as a rule, hardly fit in the dishwasher basket or even not fit at all. So that you are not faced with such a dilemma, we recommend from the very beginning to take a closer look at models with adjustable baskets. Raising the top box, you thereby increase the net volume of the bottom box, and therefore your chance to push a large saucepan there. Some manufacturers equip their equipment with the Rackmatic system for easy moving boxes. With it, you can easily lift the top basket to the desired height, even if it is filled with dishes. And one more pleasant innovation for users who put comfort at the forefront is the unique lifting mechanism ComfortLift. 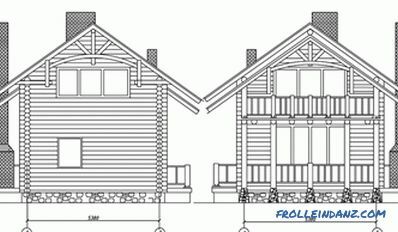 In models with the ComfortLift system, the sliding mechanism of the lower box is supplemented by a lifting mechanism. This will allow you to raise the lower basket to the level of the upper one with one hand movement, which means that you will not have to bend down when loading and unloading dishes. A heat exchanger is a special element that provides significant energy savings. It is a block consisting of two separate circuits along which water circulates. One of these circuits is filled with cold water from the water supply, the second with hot water remaining from the previous stage of the cycle. A hot circuit gives off its heat to the cold. Thus, the waste water is not immediately discharged into the sewage system, but helps to slightly warm the cold water entering the tank. In other words, the heat exchanger allows you to accumulate the remaining heat and use it in the subsequent wash cycle. This reduces the amount of electricity spent on heating water to the desired temperature, which increases the energy efficiency class of the machine. The heat exchanger is used not only to preheat a fresh portion of water, but also to dry dishes, as we mentioned above. 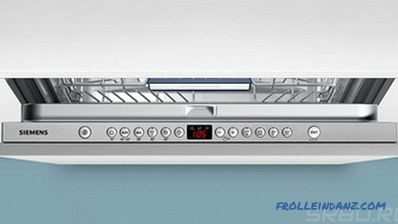 This option of drying dishes is considered one of the most economical and quiet. Tightly loaded baskets can cause a reduction in the quality of dishwashing. And then come to the aid of all kinds of nozzles for splashing water. They will ensure the penetration of water into the most inaccessible lye and thus help to better wash all the dishes. Sprayers of a wide variety of shapes that guarantee high quality dishwashing orbital washing systems, ensuring even distribution of water throughout the chamber, alternating water supply technology, creating an optimal balance between washing quality and water consumption and providing an excellent result of washing dishes all levels of its placement - which was not thought up by engineers of leading companies to improve their products (and, sadly, to increase its value). The most common water distribution system consists of rocker arms located at the top and bottom of the sink. During rotation, they create abundant water flow, which, falling on the dishes, washes away all its dirt from it. The system is simple and quite effective. Orbital water spray system ensures even distribution of jets water throughout the chamber. The system consists of two rocker arms, large and small, which is fixed at the end of the large one. According to the manufacturers, the advantages of such a system is that it is able to more thoroughly deliver water to hard-to-reach areas. This is its main difference from the system with one beam. Water is our most valuable resource, and you need to treat it carefully, regardless of the cost of a cubic meter from your supplier. When using the dishwasher to save water (as well as the electricity consumed to heat it) will help its repeated use. Of course, to reuse the water that has already been in the cycle, it must be cleaned by passing through a special filter. Since only a clean filter can guarantee good washing quality, it should be periodically cleaned. Even if your dishwasher doesn’t reuse waste water, the filter still has it all. Otherwise, the remnants of food falling into the dishwasher with dirty dishes would instantly clog the drain hose, and in the worst case, the sewer pipe. an unpleasant smell appears in the dishwasher, which is a consequence of the rapid reproduction of numerous pathogenic microorganisms. It sounds scary, but regularly manually cleaning the desire filter still does not appear ... Many dishwashers of the middle and high price segment have long been able to cope with this task without human intervention! And all thanks to self-cleaning filters installed on them. The principle of operation of such a filter is quite simple: food residues deposited in a special collector are ground and simply washed into the drain. 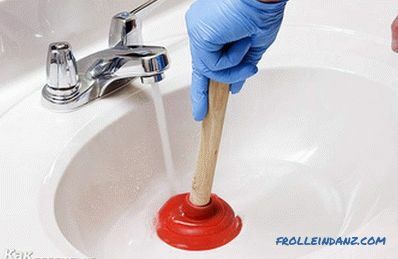 Do you want to “bathe” delicate thin glass objects and at the same time clean the most dirty dishes - pans, pans, pots? A zone of intensive washing, usually located at the lower level, will make this task solvable. In this zone, water is simply supplied under higher pressure, and this is precisely what is needed in order to wash off a thick layer of fat from a saucepan or baking tray. 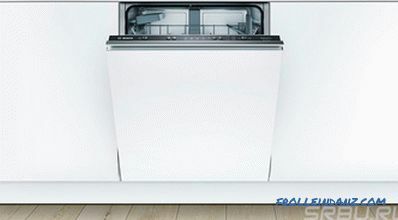 With the AquaVario function implemented in some Bosch models, the dishwasher can automatically adjust the water pressure depending on the degree of soiling of the dishes and the program selected by the user. Inverter motors are gaining more and more popularity among owners of dishwashers and other household appliances. And this is not surprising, because such an engine helps to increase the reliability and efficiency of the dishwasher on which it is installed. But the main advantage of the inverter motor from the point of view of the average consumer is not even in this, but in the low level of noise generated during its operation. Most machines equipped with inverter motors, the noise level does not exceed 35-40 dB. This is especially true for the owners of apartments and houses with an open plan, because many people lay the dishes for the night hours. Illumination of the working chamber is a very useful option, but it is provided, alas, by no means in all models. Lighting makes working with a dishwasher more convenient, making it easier to load and sort dirty dishes and unload freshly washed. Why many manufacturers refuse such a useful for the consumer function is not clear, because it is easy to implement, and its presence has virtually no effect on the cost of the final product. Every future owner of the dishwasher should take into account that much can be washed in it, but Not everyone. So, for example, woodwork - wooden bowls, spoons, cutting boards are not subject to automatic washing: after such a test, the wood becomes rough and therefore very unattractive. 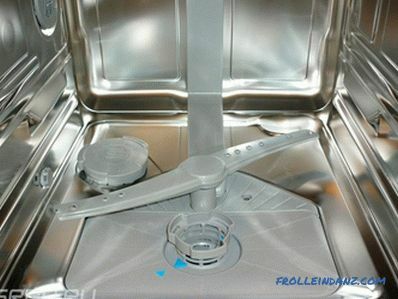 It is not necessary to load silver cutlery, aluminum, brass and tin products into the dishwasher: under the influence of detergents, their surfaces become dull and it will be very difficult to achieve initial brilliance. If you decide to send glasses and wine glasses made of crystal or thin-walled glass to the dishwasher, select a delicate program and fix the dishes with special holders. This will protect the glass from tarnishing as a result of contact with hot water and from cracking due to contact with other objects. You should also be very careful with earthenware, porcelain and objects with a fragile pattern. At low temperatures, you will also have to wash plastic dishes - with strong heat, it can deform. The main trouble that may lie in wait for each owner of the dishwasher (as well as the washing machine) is water leakage. 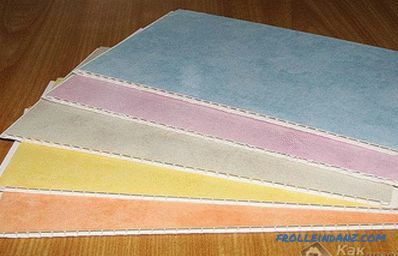 To protect you and your neighbors from the "flood" and the problems associated with this will help the leak protection system, which today equip their products almost all manufacturers. Each model has its own level of protection, which is determined, among other things, by its price category. The multistage leakage protection system includes additional body protection, multi-layer hoses, water quantity sensors, special valves that shut off the water supply in case of problems, pumping out pumps. How much will all this help escape from the "flood"? Bosch and Siemens, for example, are so confident in the quality of their products that they promise to compensate for all costs if the "flood" does happen.Russian lovers of “Avos” should remember, however, that any guarantees apply only to qualified connected equipment. If you have a small child in your family, choosing a dishwasher, make sure that it has a "child protection" function. This function provides the ability to block the control panel so that playful knobs do not knock down all the settings, as well as the presence of a special lock that locks the door so that the baby can not look into the car during its operation. Some manufacturers decided not to equip their appliances with a special lock, but implemented the child protection function in a different way: when the door is opened, the washing process automatically stops and will be resumed only after it is closed. Such a decision could come to mind only to people who have never had children. It is not a solution, because, regardless of whether the process is stopped or not, access to the inside of the chamber in the middle of a cycle can cause burns with steam and / or hot water. 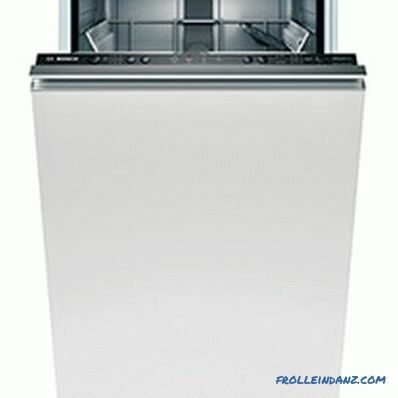 In accordance with the current European standard, each model of the dishwasher (as well as any other household appliances) is assigned a class for a comparative assessment by the consumer of its energy efficiency , denoted by Latin letters from A to G. The higher the class, the lower the electricity consumption. 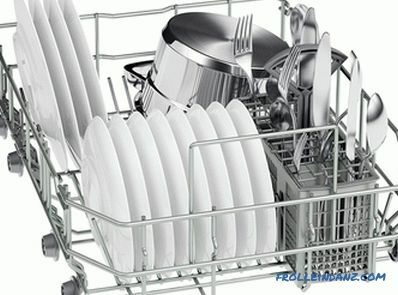 A class A dishwasher for washing 12 sets of dishes should use less than 1. 06 kWh. Today, the highest energy efficiency class A +++ is assigned to some models of Bosch, Siemens, Candy, Hotpoint, ASKO dishwashers. But they are not champions, but individual Miele models with class A +++ - 20% and consuming about half the amount of electricity than ordinary dishwashers with class A. 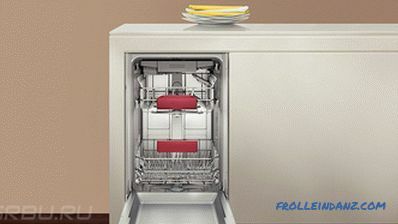 A number of technologies are used to achieve a high-efficiency dishwasher , and at all stages of washing. 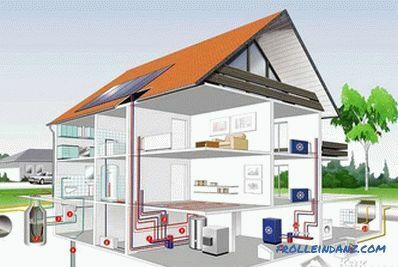 For example, simultaneous connection to cold and hot water supply saves up to 50% of electricity. Installing a heat exchanger in the dishwasher makes it possible to warm the cold water entering the tank and dry the dishes without additional heating. The intelligent washing program helped to achieve high energy efficiency indicators for many models of dishwashers, consisting in optimizing the use of resources depending on the load and a differentiated approach to dishes with varying degrees of pollution. And these are just a few of the tricks of the manufacturers with the help of which they manage to achieve such amazing results. Modern dishwashers can save not only electricity but also water. 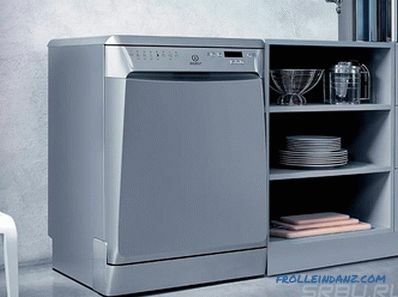 The current consumption of dishwasher water is 17-20 liters per cycle, with highly efficient models this figure is reduced to 10-12 liters, and sometimes even lower. You have to agree that you will hardly be able to wash 10-15 sets of dishes manually with such amount of water.